I can't believe it's 2018 etc etc - a phrase you'll probably hear a thousand times over the next week along with 'did you have a good Christmas?' and 'oh I just had a quiet New Year'. However, with a new year comes a bit of reflection and, as I'm a 'style' blogger I thought I'd do a little roundup of the outfits and particular items I have completely adored and worn to death over the course of 2017. I really want to do more outfits and style content this year and I'm going to make it my mission to get lots shot, as they're my favourite thing to ogle over on Instagram and on other blogs. My style isn't exactly mind blowing, but I feel a lot more comfortable in the outfits I wear and the sartorial choices I've made this year. I haven't quite got my style 'down', but I've realised the shapes that suit me, the colours I love and the overall look that I prefer to wear. So, let's discuss some faves, shall we? 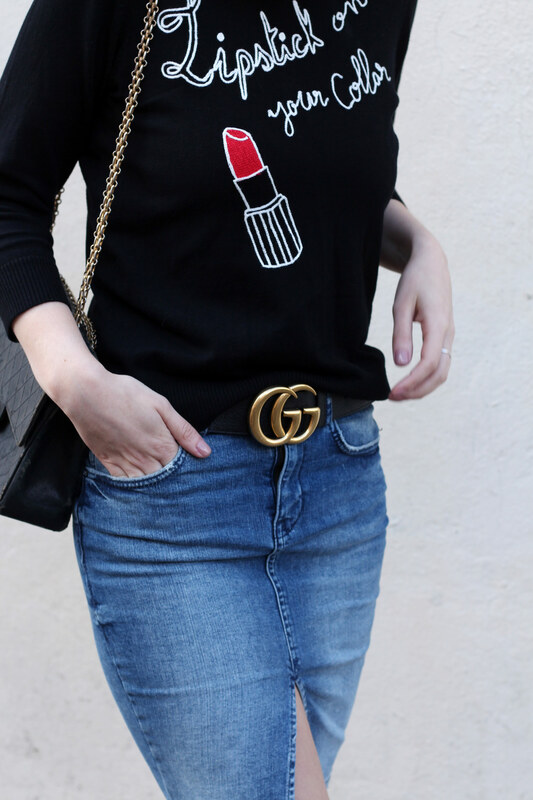 O U T F I T P O S T H E R E | Bit of a broad thing, I know, but I've been loving the whole oversized cardigan + simple tee + high waisted jeans look this year. I picked up some cheap cardigans in the sale (like the camel one above) from H&M for about £10 each and they've served me so well - I'm wearing one as I type. I also love the patterned cream ASOS one as it looks amazing with navy and stripes! O U T F I T P O S T H E R E | I'm not a huge floral person, but I was a little bit in love with this Topshop dress over summer. It's all I wanted to wear and it was brought out on a few occasions when I went to Tuscany. It's just the perfect shape, colour and print. O U T F I T P O S T H E R E | I totally copied Chloe on this one, as I tried hers on and knew I had to hunt down my own (plus I become obsessed with this outfit). 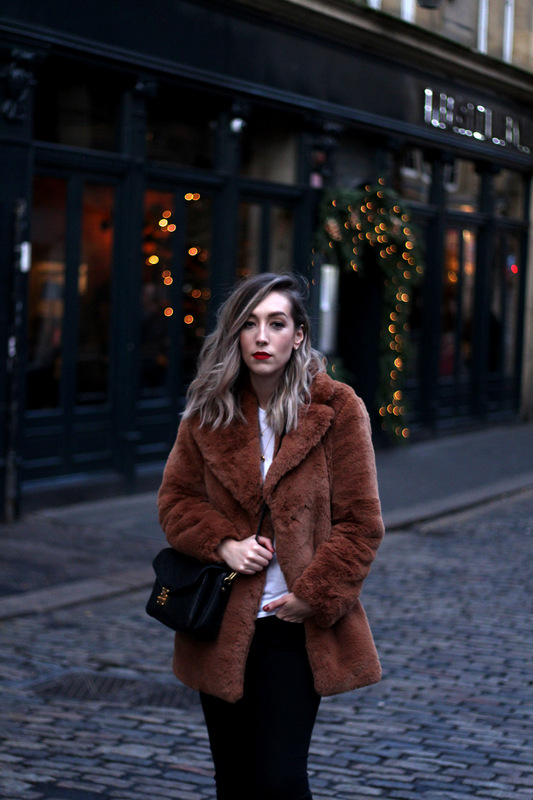 It's oh so warm and cosy and I think it kicked off my obsession with warmer tones which continued throughout the year and is my current favourite thing! O U T F I T P O S T H E R E | Even though this has only appeared in one outfit post, it was one of my all time faves of the year! It's just such a gorgeous tone and the buttons really complete the look, I think. This looks great as an extra layer under coats for a bit of colour and amazing dressed up or down. Raw Hems and Cropped Lengths. O U T F I T P O S T H E R E | Like the black Whistles jeans in the photos above and to the right, I've had a bit of a thing for slightly cropped jeans and raw hems this year. The Topshop Moto jeans have been my surprise faves this year, as I really don't rate Topshop jeans but dayummm if I'm not addicted to wearing them now! I've also been wearing my Boden trousers to death this season, as they're honestly the most comfortable black trousers I've ever put on my body. O U T F I T P O S T H E R E | You are probably sick to death of seeing these, but they're one of the most easy to wear boots I've ever bought (well, got as a present for my birthday...). I'm beyond obsesssed with them and I can't see that ending any time soon! O U T F I T P O S T H E R E | This is a recent purchase so feels a bit weird to add it to a favourites list, but I've barely taken it off my back since it landed on my doorstep. The quality is amazing, it's insanely warm and just feels so luxurious. It's still available now so I would snap it up for the crappy Jan-March weather! O U T F I T P O S T H E R E | I bought this at the end of last year and wore it obsessively until Spring and it's back out of the wardrobe now for Winter. I'm a strong advocate for spending a bit more to get durable materials or nicer quality coats as they really will last you from season to season. I adore the classic oversized shape, the large lapels, the length and the colour is just dreamy. O U T F I T P O S T H E R E | I wrote a whole post on this here, but it has been my only designer bag purchase of the year and it's undoubtedly my favourite and most worn of the entire year. I think I swapped bags for maybe a week or two since I bought it at the end of April - so that's saying something! It fits so much in it and it looks as gorgeous now as it did when I got it out of the box. Still obsessed. Still going to wear it non-stop into 2018! O U T F I T P O S T H E R E and H E R E | My most worn shoes have to be my Gucci loafers. I remember when I got them at the beginning of the year for my trip to Paris and I've obsessed ever since. I wore my red ones for the first time while I was there and I walked over 20,000 steps without a single blister or any pain - that's pretty darn amazing! The fluffy ones are just so chic and look great with so many outfits. Such good purchases... and now I want more - black, pink and brown versions of the full loafers may have to join the family this year. In my next style post I'll be discussing what items I want to pick up next year (I'll be on the hunt for the perfect women's parka coats, to start with), who I'll be taking inspiration from the, the images I've been loving and totally want to emulate in my wardrobe. I'll probably put this up at the end of the week, so keep an eye out for that.